Huh. Is this an RKO picture? 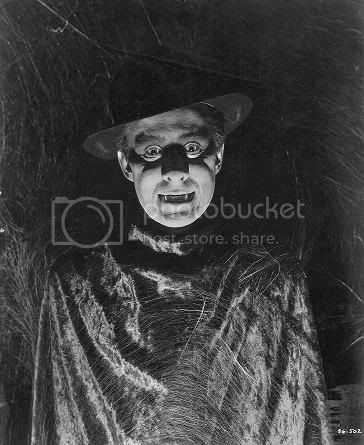 It sorta looks like the hat and outfit the 'Mystery Man' wears in HORROR ISLAND, but he had a mustache, a vague resemblance to John Carradine, and jug ears. More guesses. You did say he could "haunt yer dreams". The Mad Doctor of Market Street? the PHANTOM SPEAKS (1945)? Mebbe? Okay, OKAY!! Uncle, uncle, UNCLE....ow!!!! Hint, maybe? DEAD MEN WALK (1943) maybe..? George Zucco does wear a hat in this at some point, I think. GEORGE ZUCCO is not in this film. Here's your hint: the leading man left films right after this film, returned several years later only to headline in many B Westerns before dying young. Oh my gosh, that narrows it down. Let me get back to you on that. Next week...maybe. Well, Javakoala, the information previously provided with a bit of deduction might help a Raffine type to narrow down the year and get this right quick. I will also point out that the character seen in the photo is not the leading man, but rather, the subject of the film's title. You seem to assume I have a brain. Dennis Leary sucked that little thing out months ago. What with him being an alien and all.